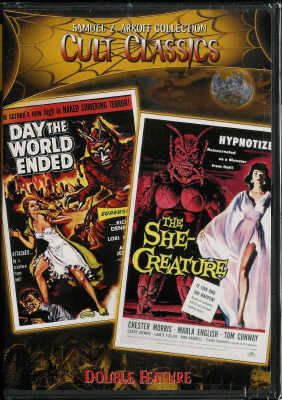 A DVD double feature from the Samuel Z. Arkoff Collection of Cult Classics. Two of the finest '50s sci-fi films! Out of print but available here! After the world has been destroyed by nuclear war, an unlikely group of survivors take refuge in a house. With tensions mounting and trust all but gone, they discover fighting each other is the least of their problems. Something outside is stalking them...something dangerous...and mutant! Directed by horror/sci-fi legend Roger Corman. A hypnotist resurrects a prehistoric female creature to kill his enemies. Now there's an idea. What more can you say? See our other double feature DVDs in the Arkoff Collection of Cult Classics!